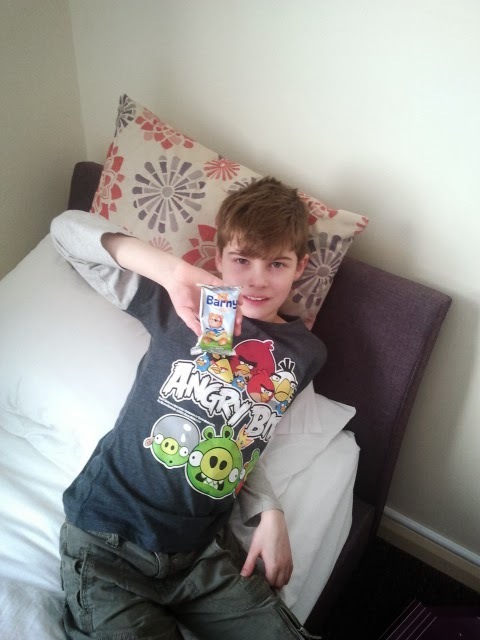 During half term we had a couple of days away and stayed in a Premier Inn in East Grinstead. We chose East Grinstead as it isn't far from Mark's brother and is also much nearer to London than we are and meant we could spend the day there and visit the Transport Museum. Just before went away we received some Barny sponge snacks to try and so when I packed the bags for our holiday I included the snacks as I thought they would be perfect when Luke was feeling a little peckish. 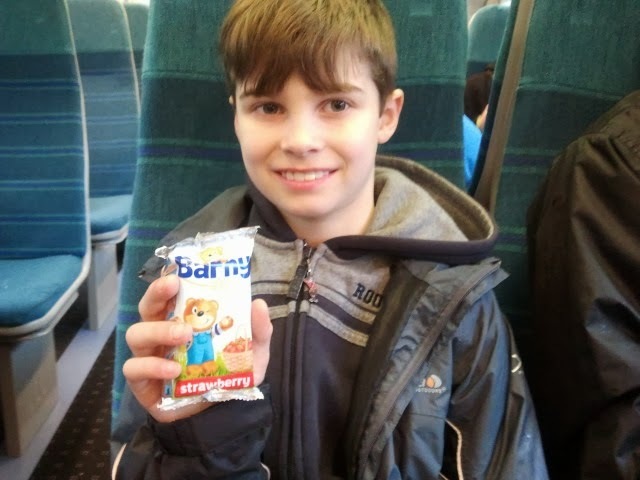 Barny's first trip out was on the train to London, he enjoyed the journey and as we had had such a huge breakfast at the hotel (Luke had 4 sausages!!!) he didn't get eaten! We were a bit too early for the changing of the guards but we did see some of the guards marching to Buckingham Palace. We walked to the London Transport Museum, it was a popular day out judging by the queue. Once we got inside Luke sat down and had a snack. William was busy looking at the displays. They both enjoyed going on the buses. 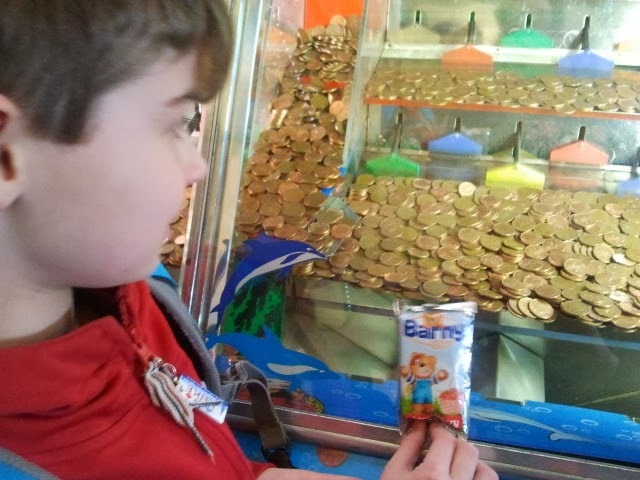 On Friday we spent the day in Brighton and Luke introduced Barny to the 2p machines. It was amazing watching the concentration on Luke's face as he tried to get the 2p coins to fall. He was actually quite good at it and with his £1 of 2p coins he managed to win about 80p back. He then decided to put it all back in and came away with nothing!! It was a very windy day but the sun was out so we had an enjoyable day out in Brighton. After a hectic day we went back to the hotel and the boys finished off the Barny snacks. 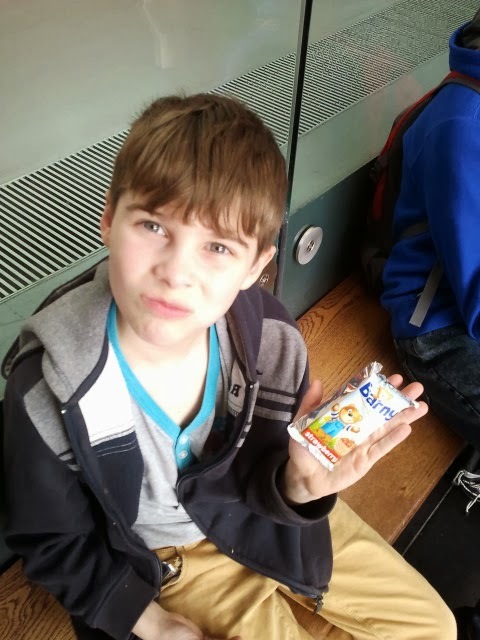 Barny is a bear shaped sponge and is available in two new flavours, strawberry and apple and with no artificial colours or preservatives is perfect for children. The boys preferred the apple one whereas I would rather have the strawberry one.